I frequently have large numbers of files in a SharePoint Document Library, that are in a "Checked Out" status for a variety of reasons. Is there a way to check them in all at once? Yes. 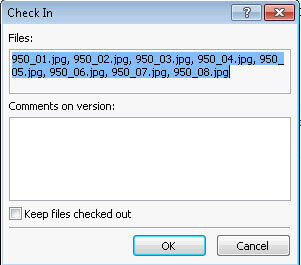 By using SharePoint Designer 2007, you can do bulk document check ins. 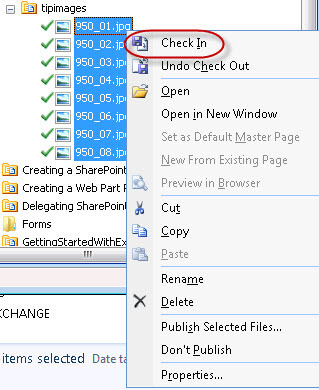 In the SharePoint Designer application, documents that are checked out are visibly noted with a green check mark next to them. To check them in, right click on the desired files, then select "Check In" from the context sensitive menu. The next page of the Check In Wizard, displays the files that will be checked in and optionally gives you a chance to make a global comment in the "Comments on version" field. (Keeping the files checked out, seems to defeat the purpose of this procedure, so leave the checkbox off.) Then click "OK". Now your documents should appear in the library without the green check marks. Currently, SharePoint Designer 2007 is a free download from Microsoft. See this tip.